The Vivaldi antenna, also known as the tapered slot antenna (TSA), is an ideal antenna for wide-band applications. It stands out due to its uncomplicated structure, simple manufacturing requirements, and high gain. When working on a Vivaldi antenna design, we can use simulation software to evaluate its far-field pattern and impedance. The Vivaldi antenna was invented by Peter Gibson. Gibson had a passion for music and he supposedly chose to name the antenna after Antonio Vivaldi, a Baroque composer. Although sources vary on this, the choice was probably due to the antenna resembling an instrument from Vivaldi’s era. The instrument in question may be a violin, cello, or a cross section of a trumpet. The Vivaldi antenna is made to be malleable. Being created on a thin and flexible substrate gives it the ability to mold itself over a variety of surfaces. This means that it can have many different applications in a range of environments. You can also find uses for the Vivaldi antenna inside of a hospital. By using this antenna in conjunction with microwave imaging, doctors may be able to better detect breast and brain cancer. The breast cancer detection function of the Vivaldi antenna makes use of an interferometric called I-MUSIC. (This is a different kind of music than what the composer Vivaldi made…) I-MUSIC stands for interferometric Multiple Signal Classification and when combined with a Vivaldi antenna, it becomes a powerful method for detecting tumors. The Vivaldi antenna (both as itself and when modified) has an incredibly wide range of functions. 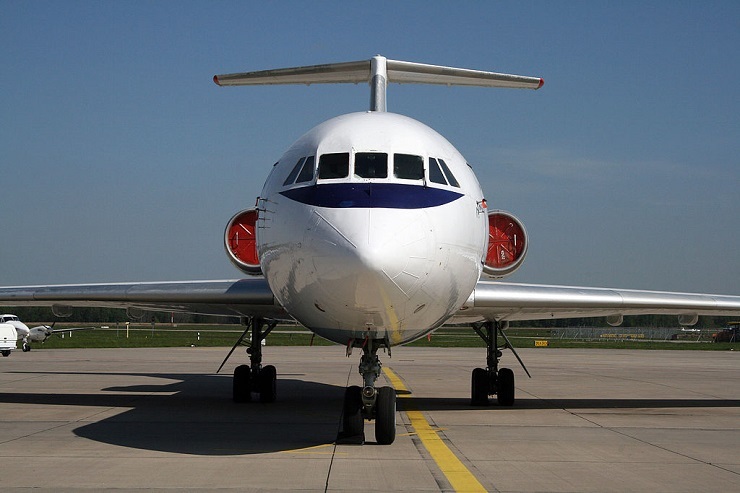 Security workers can use it to detect concealed weapons and military personnel can use it as a high-range radar when it’s placed in an array configuration. This versatile antenna can do a lot, but first we have to analyze the design to see how well it works. Using the Vivaldi, Tapered Slot Antenna (TSA) model, we can evaluate the antenna based on its far-field pattern and impedance. 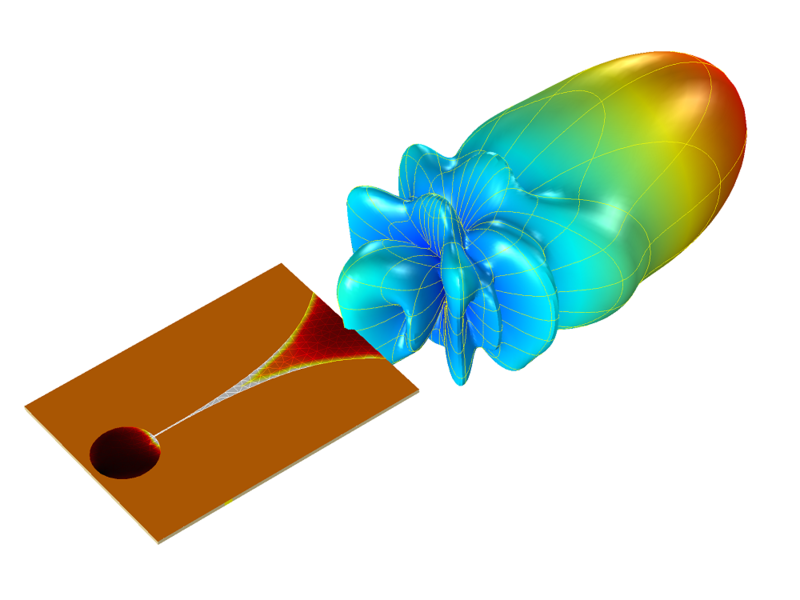 Our model simulates a realistic Vivaldi antenna design by using a thin dielectric substrate for the antenna. 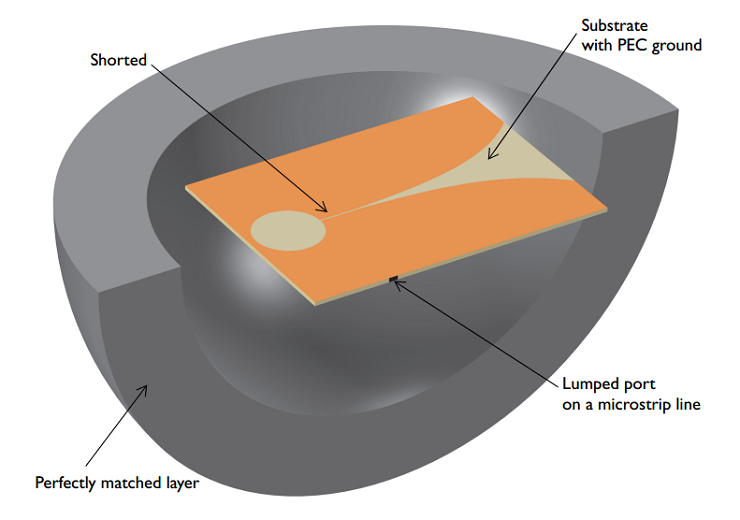 On top of this substrate, a tapered slot is patterned with a perfect electric conductor (PEC) ground plane. We build the curves of the tapered slot by using the exponential function e0.044x. The tapered slot itself does look something like a trumpet with a wide end curving into a narrow line. However, unlike a trumpet, the thin end connects to a circular slot while the wide end opens out to air, as seen below. The geometry of a Vivaldi antenna. Flipping the substrate over, there is a shorted 50 Ω microstrip feed line, which is modeled as PEC surfaces. It is a crucial element to the design since the lumped port located on the line is used to excite the antenna. 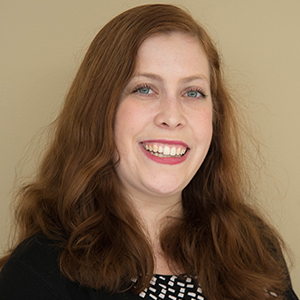 A perfectly matched layer (PML) is surrounding the whole modeling domain. This functions as an anechoic chamber and absorbs all of the radiated energy. After setting up and solving our antenna model using COMSOL Multiphysics and the RF Module, we get the results back in various forms. 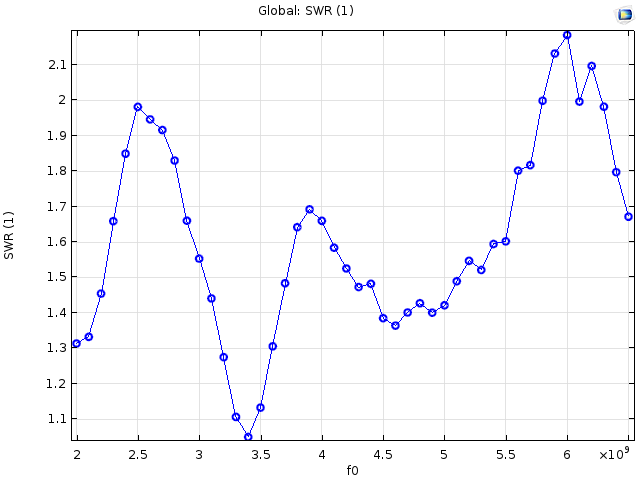 The SWR plot reveals that our model has good wide-band impedance matching. It’s even better than 2:1 in the majority of our simulated range. The results of our simulation seen in the form of an SWR plot. We also create a model to display the far-field pattern. We know that a Vivaldi antenna forms a directive radiation pattern toward the wide end of its tapered slot. Our model shows that the far-field pattern does display a directional radiation pattern. A 3D far-field pattern, displayed at 5.5 GHz.